Cherokee Boys Club, Inc – "Dedicated Service Since 1932"
The Cherokee Boys Farm Club was established at the Cherokee Boarding School in 1932. Two years later the Cherokee Motor Club was founded. When the Boarding School closed in 1954, the two Clubs were continued by the Cherokee Day School. The Clubs were combined in 1958 and continued to grow. 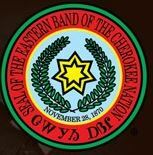 On May 4, 1964, the Eastern Band of Cherokee Indians incorporated the Cherokee Boys Club as a non-profit self-supporting, Tribal Enterprise. The Club earns its revenue by providing services for the Eastern Band of Cherokee Indians. Performance of these services provides full-time employment for our staff and on-the-job training for Cherokee Youth. All funds earned by the Club are used for operational expenses, repayment of debt incurred for purchase of Club buildings and equipment, and for projects for Cherokee Youth. The Club needs and receives donations for the operation of the Children’s Home & Child Care Services projects, vocational training and scholarship programs. All other operations of the Club are self-supporting. The Club borrowed money from financial institutions to purchase all Club vehicles, equipment, and to pay for the construction of most Club buildings. The Club repays all funds borrowed and also pays interest on all funds borrowed. All students and former students of Cherokee Central Schools (both male and female) are eligible for membership in the Club. From this membership, the Club elects five members of its Board of Directors and a Student Representative. The Tribal Council appoints one representative to the Board and the Board selects two local business people to serve on the Board. The Club’s Administrative Department includes the Finance Manager, HR/Benefits Coordinator, IT Coordinator, Grant Administrator, Payroll Officer, Accounts Payable Clerk and Receptionist. They provide fiscal, technological and HR/Payroll Services for the entire Club and the Cherokee Central School System. This department continues to upgrade their computer system so they may continue to increase efficiency. The department has a very experienced and well-trained staff with a combined total of approximately 138 years of dedicated service to the Boys Club and the Cherokee people. They strive to and continue to operate with great efficiency and professionalism. The Administrative budget is less than 2% of the total Club budget. Detailed audits are performed annually by Certified Public Accountants and Annual Reports are available to anyone upon request. The Executive Division of the Administrative Department is made up of the General Manager and the Executive Assistant. They provide oversight of all Club Operations and contracts, prepare for Board Meetings and maintain all Resolutions, Club Public Relations, Liaison services between our contract customers including Cherokee Central School, Oconaluftee Job Corp, Cherokee Historical Association, Cherokee Preservation Foundation and many programs for the Eastern Band of Cherokee Indians.